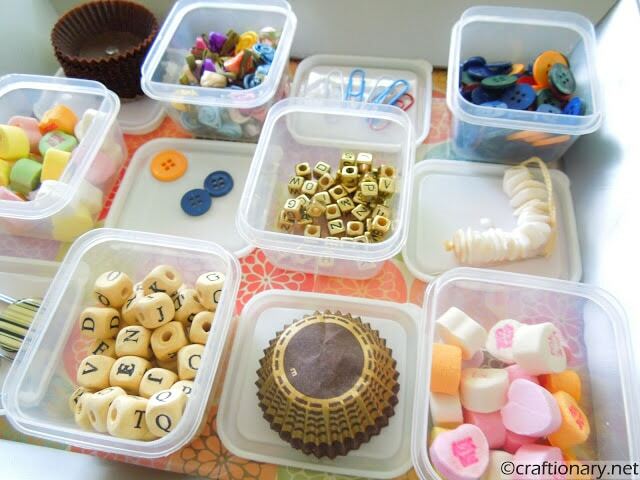 How organized are you when it comes to your craft supplies? Does it feel like it’s something impossible to do, with all those little fingers around you? 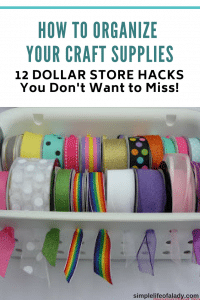 If you find that your stash of craft supplies is growing out of control, this post is for you. 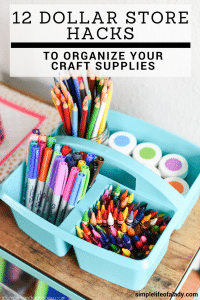 I’ve gathered twelve ways to organize craft supplies, be it yours or your kiddos’. 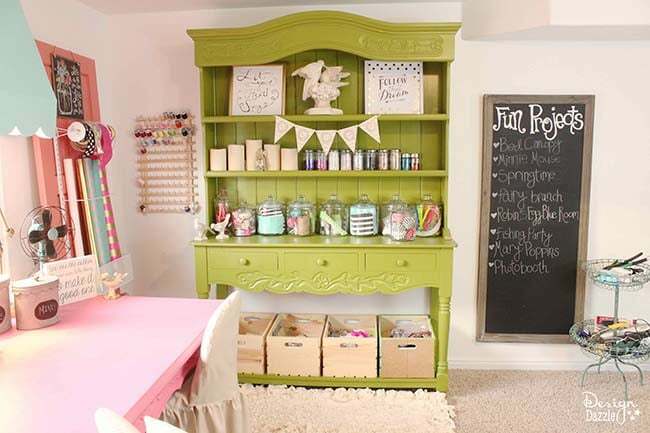 These are brilliant organization solutions that you will surely love! 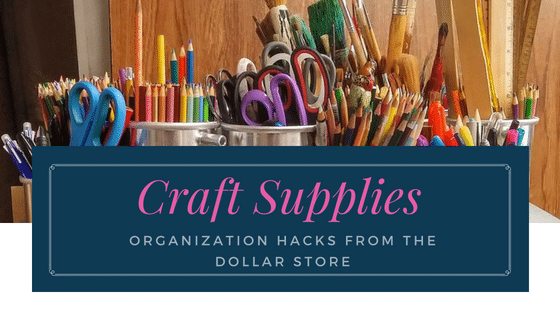 They are easy to do and all these come from the dollar store, because we believe that organization projects don’t have to break the bank. Anybody there who loves crocheting? This one’s for you! When you use a pencil grip, it allows your fingers to move freely. That’s why it is recommended for kids who encounter difficulty in writing. And it does help in improving their handwriting. If that’s the case, why limit its benefits to handling pencils and handwriting only? You can use it too in crocheting! 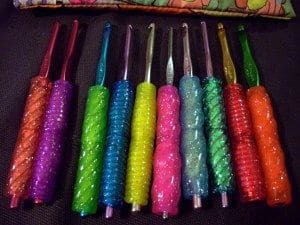 Use pencil grips to make crocheting hooks easier and more comfortable to handle. These can also reduce the fatigue and pain that you might feel in your hand when you crochet. To do this, here’s the instruction from Dollar Store Crafts: Wrap the bottom of your crochet hook with masking tape until it’s about the width of a pencil. Then slide two pencil grips onto hook. This is very ideal for your tiny craft supplies. Group them together and never lose sight of them again! And it’s so easy to do with plastic lid boxes! Simply arrange the boxes in a tray. Use labels if you like. Visit Craftionary for the tutorial. I promise you, it’s very easy to do! This is Palma’s favorite organization hack and I can see why. Because this is so easy and simple! 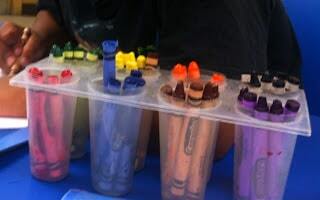 This organization hack is highly appreciated in a kindergarten classroom, when the kids are gathered into groups, and you have to sort the crayons to make sure everyone gets a color. But who says you can’t apply this at home? When your kids love art, just seeing a lot of crayons in place can already spark that creativity in them. Plus, this will help you in teaching your kids simple organization skills. Instruct them to classify the crayons according to their colors and into each popsicle spot. And when they’re done with the crayons, return them to their respective spots. These popsicle trays usually go on clearance at the end of summer. So make sure you grab one when you make your trip to the dollar store! If you prefer your craft supplies covered, use a soap container. 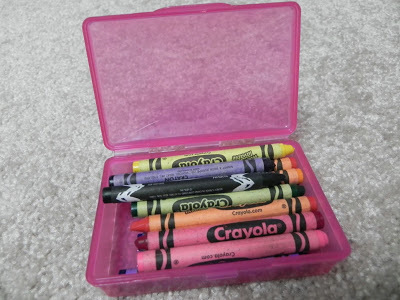 You can also use it to store crayons. What’s so good with soap container is that you can easily bring them if you’re traveling. No need to fuss over how you’re going to carry your kids’ crayons and other craft supplies because they’re already packed. Just grab them and stuff them in your kid’s travel bag. You can also use it for jewelry-making beads. Soap containers also take up very little space. 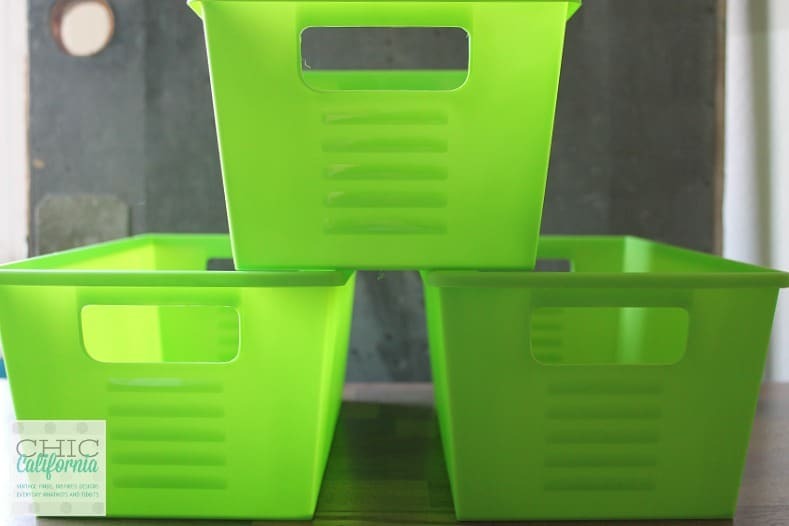 A plastic caddy can be used not only for the kitchen and bathroom but also in the craft room. 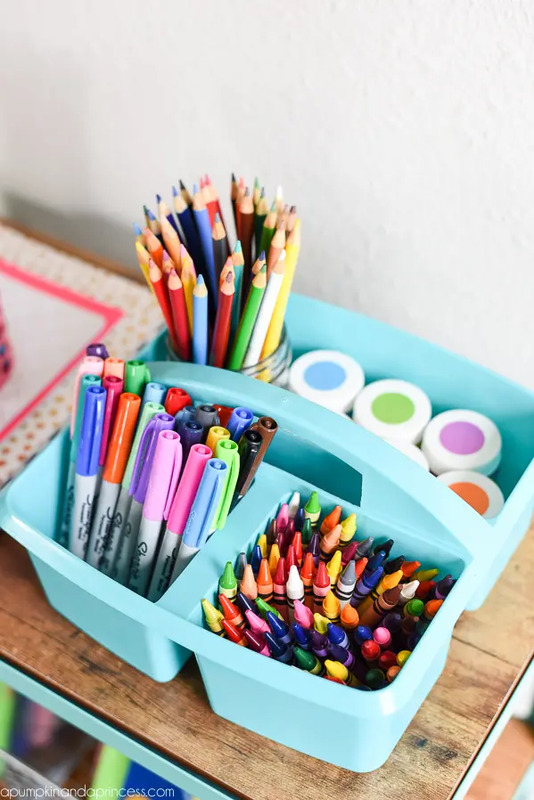 Organize your kids’ crayons, paint, colored pens and markers in one place with a caddy. Also, it has a handle so you and your kids can easily take it anywhere around the house. 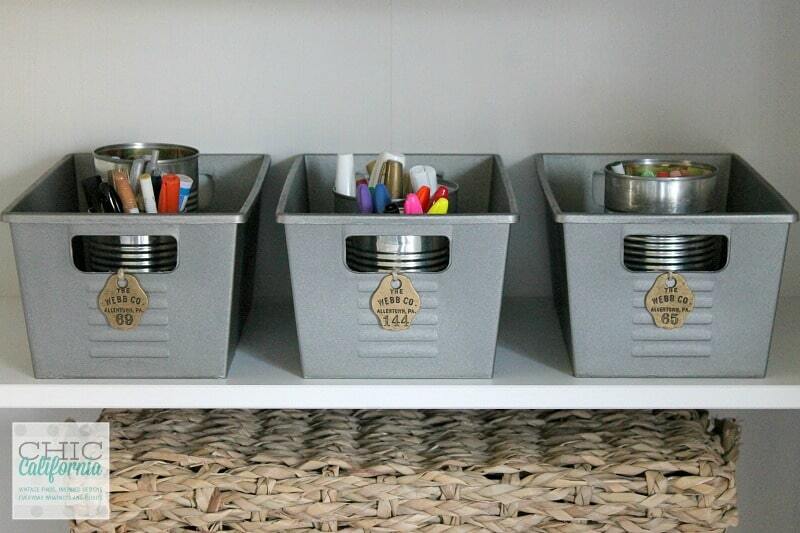 Another great tool for organizing craft supplies is a craft bucket. 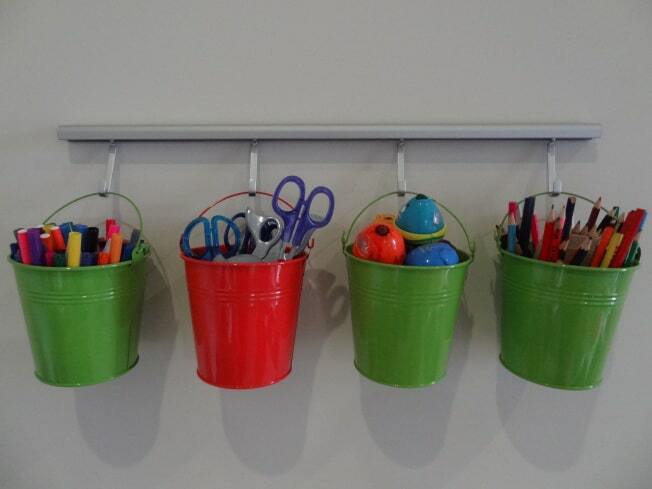 Craft buckets are smaller than the regular garden bucket which makes them lighter and easy to hang on the wall. So if you want them off the floor, you can easily do that. Select colors that match with the other items in the room. Or bright colors to brighten up your day. If you can’t find the color that you want at the dollar store, don’t forget that you can always spray paint them. So just grab a bucket and continue with your organizing plans! 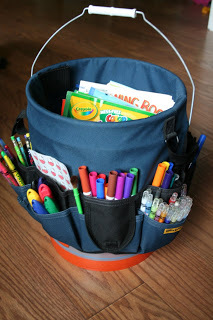 Another brilliant organization tool that you can use for your art and craft supplies is a simple mop bucket and a tool belt. The concept is similar with the caddy and the buckets. It’s just that this one is larger and can be an all-in-one spot for your art materials. Just hang the belt around the bucket. Use the belt’s slots for crayons, paint, markers, colored pens and other supplies. Then place the coloring books, papers and notes inside the bucket. Carry it wherever you and your kids want to work. Just like the buckets and the caddy, you can take it anywhere in the house. 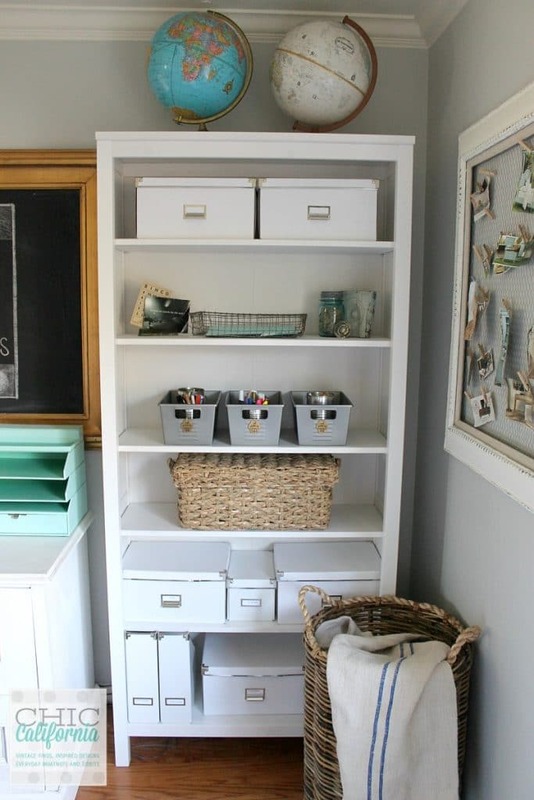 When done, simply return the art materials in their respective slots and bring the bucket back to your craft room. I don’t know what it is about cheese, but this is the second time that I’ve come up across something that is meant to be for cheese, but turns out to be a creative solution for organizing something else. If you’ve read my post on Closet Organization Hacks from the Dollar Store, you know that you can use a cheese grater to organize your earrings. 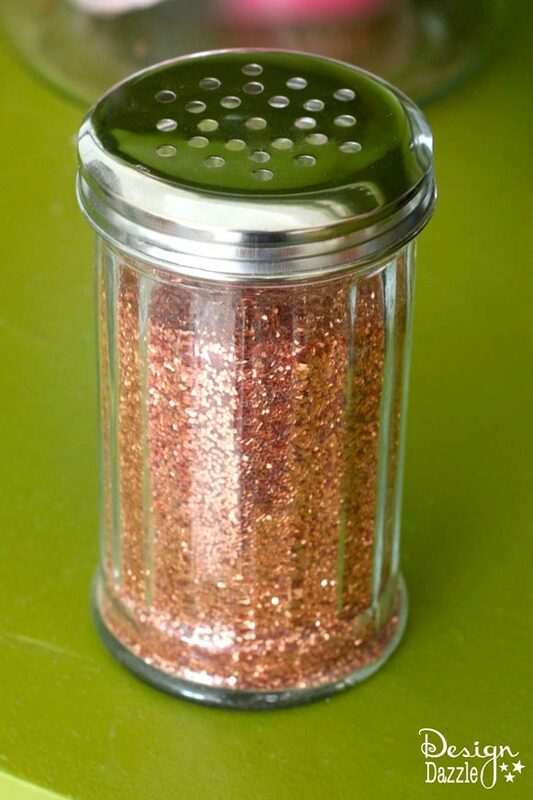 Now you’re looking at cheese dispenser, which proves itself to be a real solution for organizing glitters. Maybe it’s just me being so much awed by the creative organization tips that I learn everyday. Perhaps because I’m not an organization pro. 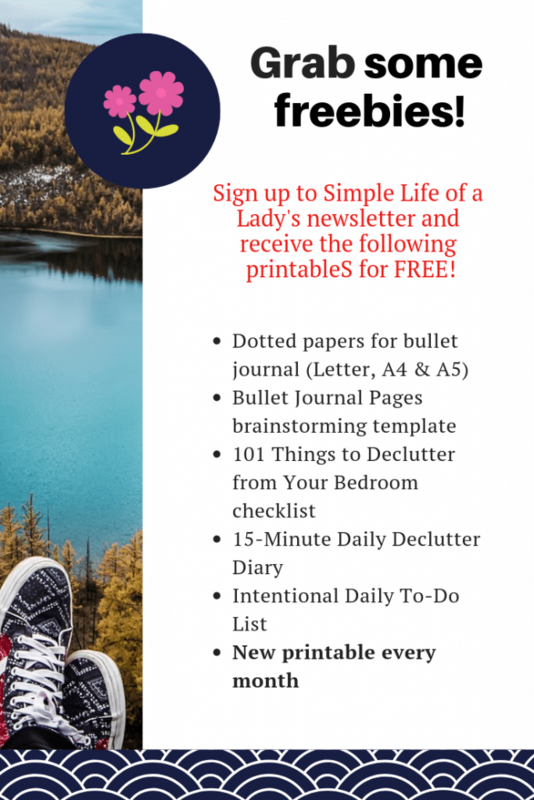 But you know what’s the best thing I’ve learned so far since taking that decluttering step? It’s that you don’t have to be a pro to get organized. You can be a simple homemaker who is just open to possibilities and loves to learn consistently from the creativity of others. 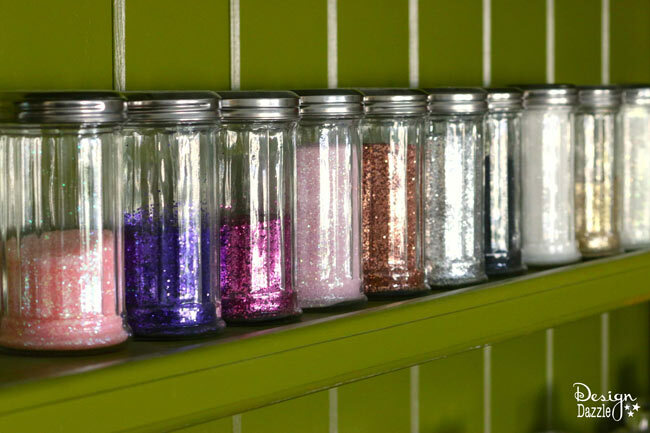 An array of glitters neatly and beautifully stored! Now take a glance at her craft room. If you want all of Toni’s craft room solutions, there’s more at Design Dazzle. You sure can find a lot of plastic bins and containers at the dollar store. If you have a shelf, simply arrange them in there to maximize your storage space. Some use them as is and they work just fine. These are from the dollar store. But they didn’t look like that when they were bought. They were green-colored plastics . I don’t know if these bins also come in metallic color. I saw plastic metallic buckets at the Dollar Tree, but not sure if they also have that color with the bins. Well anyway, if you want a vintage-looking bin but can’t find one at the Dollar Store, just get those colored plastic bins and spray paint them. That’s what Adrienne did when she made this project. She spray painted it to get the perfect metal look! Now this is how it looks like at Adrienne’s place. The bins are now home for her markers, pens and scissors. If you want vintage locker bins too, check out her full tutorial on the project. Have a messy ribbon box? This one’s for you! Get yourself a plastic container with holes. Stick a rod through inside. Then thread the ribbons on. When you get to the last ribbon, stick the rod through the other end. Finally pull the ribbons through the holes. Do it with another rod and a set of ribbons. Now, you have two sets of ribbons ready to be pulled out! Who doesn’t love mason jars these days? They are very good containers and really fun to use. You can get them for your spices, makeup, for home decors and of course for your craft supplies! 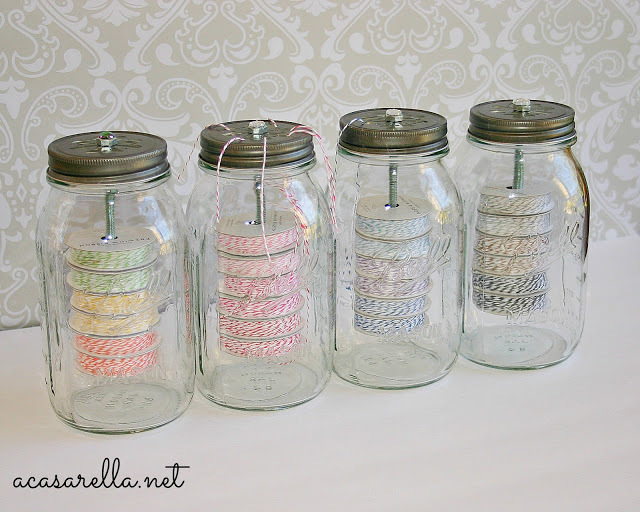 Here are three ways you can use mason jars in the craft room. Here’s the idea: Store baker’s twine in a mason jar topped with a daisy cut-out lid. Then thread the string through the cut-outs for easy access. Now off we go to the next! If you love sewing, this is for you! 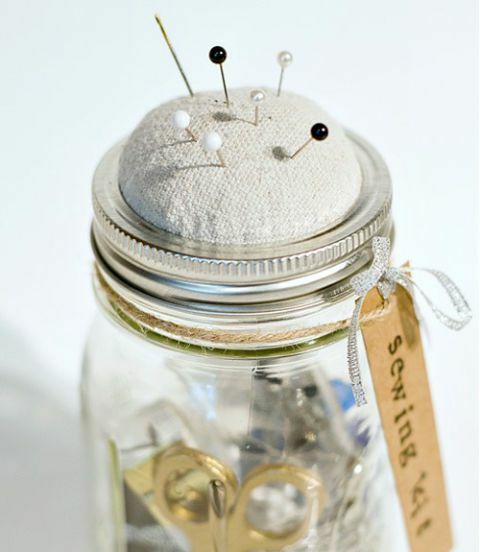 You can use mason jars to fill with your sewing materials – buttons, needles, scraps, you name it! When it comes to the color, you can leave the mason jar as is, in its transparent look. That makes it easy for you to see what’s inside. But if you want it to be colorful, you always have the choice to spray paint it. Now to a pin cushion out of the lid, you will need mason jars with lids that come apart, fabric scraps, stuffing, and scissors. Here are the directions from Ashley. Take a larger chunk of stuffing than you think. Turn the lid insert upside down and place the stuffing on the bottom side. Wrap your fabric scrap around the lid insert. Place the outside of the lid over the fabric. Cut out the excess fabric, or glue down the excess to the inside of the lid. These directions come with pictures. Take a look at them here. 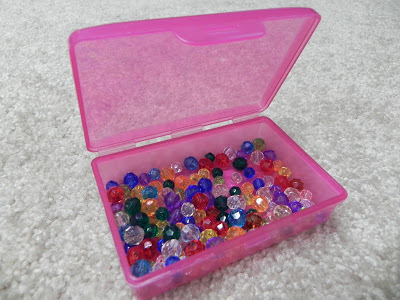 Glitters… rubber bands… pearls… beads.. you name it! Linda worked on a little creativity in here by painting the lids with chalkboard spray paint. 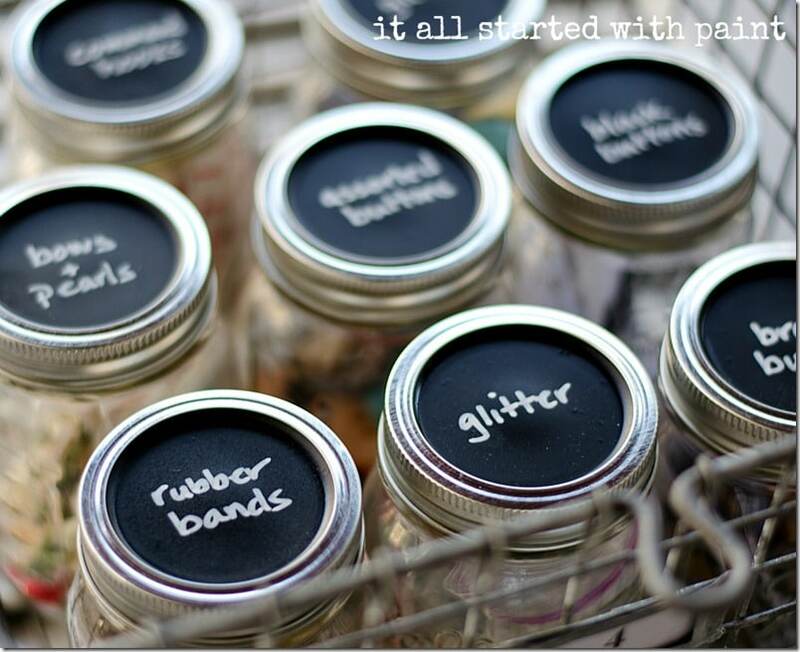 She then used a chalk pen to write each jar’s contents on the lid. 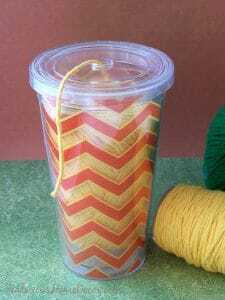 Just remove the straw, then fill the cup with a roll of yarn. Now your yarn has a decent home. If you are planning a trip to your local dollar store soon, remember to check out these items. 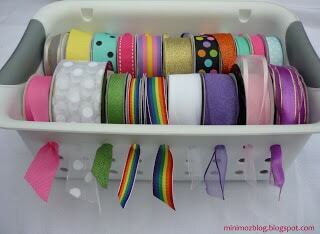 Keep your craft supplies neatly arranged and feel free to be creative. Just remember, organization doesn’t have to be expensive. Again, all you need is a little bit of creativity and imagination! And of course open-mindedness to learn from other people. 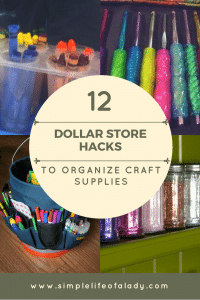 Do you have more items from the Dollar Store that can help organize craft supplies? If you do, feel free to leave a comment. I’d be very much happy to know about it! Thank you for giving credit for my popsicle crayon sorting tray idea. I appreciate it. It is I who should thank you Palma, for sharing such great idea!